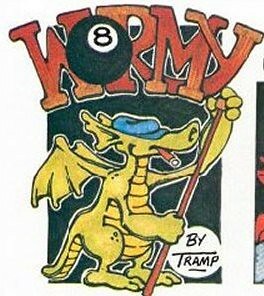 Wow, while perusing the Troll Lord Games Forums, I noted a link to some guy’s site who has digitized all the the old Wormy comics from the OLD (’77 – ’88) Dragon Magazines. It looks to be the artist “Tramp”, aka Dave Trampier. I was already feeling a bit nostalgic about Old-school gaming looking through Castles & Crusades stuff (and other Old-school D&D Emulators)….now, doubly so. Wormy was a part of my youth and reminds me how I used to relish each Dragon Magazine (and later Dungeon Magazine) once upon a time…. We, being just kids with very limited funds couldn’t subscribe; we bought each copy that we could afford very judiciously at our local bookstore/gamestore. Later, as an adult with a job, I was able to subscribe. This was just around when D&D 3E was hitting the news….it wasn’t quite the same. Maybe it was the absence of Wormy (at least in part. Anyway, thanks for the memories, Dave! I’m also a bit sad again as I remember when I let me Dragon subscription lapse…..and then how they eventually ceased print publication (though it is still available as an e-zine)….unrelated coincidence? I think not. Apparently, they couldn’t go on without me….